When my granddaughter was eight years old, we visited the Los Angeles Equestrian Center. I took a number of photographs and painted this watercolor and pastel painting from the reference material I got that day. 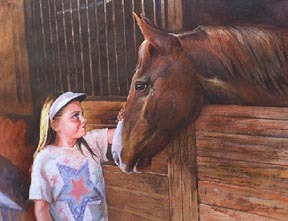 Painting and drawing horses was an important part of my childhood. 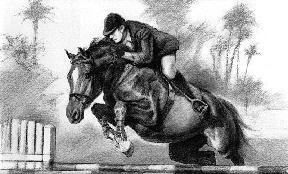 I used to spend my time copying drawings from the Walter Foster series of art books to learn the anatomy of horses and how to draw them. I spent so much time trying to learn to draw horses that I started being able to draw them for my head. I can still remember many of the things I learned about drawing horses that I learned in my childhood. 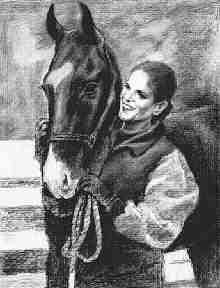 I dearly would have liked to have had a horse of my own, but our family was not able to afford to purchase one. However, I did take horseback riding lessons. When I was a young child I used to imagine that there was a pony in my closet when I was going to sleep.